Dr. Robert Zukas, D.O., is in his second-year residency with St. Anthony Family Medicine Residency Program. He is currently spending the month of May at Purcell Municipal Hospital. A second-year resident will be practicing with physicians and emergency room personnel during May at the Purcell Municipal Hospital (PMH). Robert Zukas, D.O. (Doctor of Osteopathy), began his month-long rotation with the hospital through St. Anthony Family Medicine Residency Program. A doctor of osteopathy medicine has the same training as a medical doctor (M.D. ), but studies extra curriculum of manipulative therapy that is similar, but not the same as a chiropractor. The Pennsylvania native chose St. Anthony after he had rotated a couple of times at the hospital during medical school. “I looked at the options and through a lot of prayer, chose St. Anthony,” Zukas said. Zukas decided to study medicine his freshman year of high school. “My brother was a pole vaulter and was about to break the state record. “During one of his practices, he slipped and fell suffering a traumatic brain injury. “That was my first experience with medicine after seeing him get better,” the doctor said. Zukas studied pre-med during his undergraduate years. Zukas grew up in a rural town of about 1,500 near Pittsburgh, Pa. He graduated medical school from Lake Erie College of Osteopathic Medicine (LECOM) in 2010. Zukas completes his third-year residency program in June 2013. He enjoys working at a rural hospital. “My main goal is being in a community where I can help people and give back,” he said. 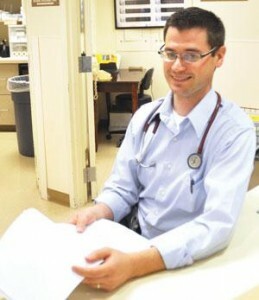 “There is a need to connect in a rural community and by me helping in whatever small way I can is an accomplishment.” Zukas said he can be a link between the complicated medical community and everybody else – “people just like me.” The doctor worked in a rural hospital in Pennsylvania and said it was his favorite experience. Zukas will be working with doctors, Brian Dye and Heather Lynch, in addition to working in the emergency room. “The smaller communities seem less busy,” he said. People are very nice here, not standoffish and are so open and nice. It is so different than other places,” he said. “I’m loving my time here and enjoying it. It’s a great place.” Zukas and his wife, Lizzy, have four children; three-months, one year, three and five-years-old. The 31-year-old doctor and his family live in Norman. This article published with permission of the Purcell Register.